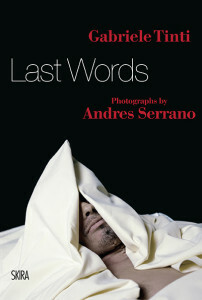 Last Words is a collection of found poems. Its conceptual basis is dramatic: to recover the lyricism of the last moments. Gabriele Tinti has with this aim composed the last words of ordinary people who chose to commit suicide into a collectanea, a single, long, painful, moving poem of reality. Their words have been organised by the author into a kind of collective epitaph and faithfully recorded without any kind of alteration, freeing them of any pathetic attempt at identifying, fiction or literary affectation. They are lethal, terrible, lucid words written as a shout, a scream, in serenity, with awareness, at peace; words that contain all the terrible complexity of life. In being last words, the end of all communication, of every vital impulse, they testify to the most authentic difficulty of being men. The book contains an essay by Derrick de Kerchove and is enriched by pictures of people who died by suicide, taken from the scandalous series ‘The Morgue’ by Andres Serrano.